Shawnboda Mead (left), UM journalism Dean Will Norton and Brandi Hephner LaBanc (right) congratulate award recipient Jennifer Kirby-McLemore. OXFORD, Miss. 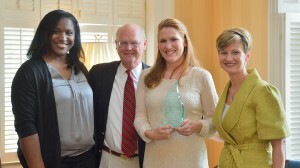 – University of Mississippi law student Jennifer Kirby-McLemore has been named the recipient of the inaugural Treadway P. and Mark D. Strickland Diversity Award for her efforts to promote diversity and inclusion on campus and throughout the community. The award is presented by the university’s Center for Inclusion and Cross Cultural Engagement. Kirby-McLemore has devoted much of her time to diversity awareness. As a law student, she has interned with the William Winter Institute for Racial Reconciliation; is president of OUTLaw, an organization on campus with the focus of promoting awareness of LGBT legal issues; and has worked as a student lawyer with the Mississippi Innocence Project. Her community service work has included teaching biology and science at three underprivileged schools in north Mississippi, volunteering with the UM law school’s Pro Bono Initiative with the Family Law Clinic and LGBT Documents clinic, and, before law school, volunteering for the Coldwater Methodist Church Food Pantry. She has earned numerous recognitions for her academic achievements and work to promote diversity. “It was certainly encouraging to read about the outstanding diversity-related activities that all of the applicants had experienced,” said Shawnboda Mead, director of the Center for Inclusion and Cross Cultural Engagement. “As the inaugural recipient of the scholarship award, Jennifer Kirby-McLemore stood out among others as she exemplified the characteristics that Mark and Tread Strickland were hoping for. I am beyond grateful to Mark and Tread for their generous gift and the impact they’ll have on students for years to come. The purpose of the award is to assist a deserving undergraduate or graduate student committed to promoting diversity awareness and acceptance in continuing their education at the university.